A new technique that allows scientists to measure the electrical activity in small synaptic terminals in the hippocampus has been developed by a researcher at Queen Mary University of London. 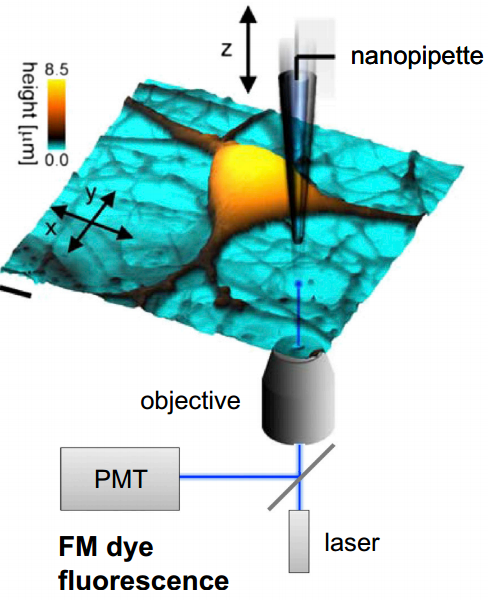 By applying a high-resolution scanning probe microscope that allows three-dimensional visualization of the structures at a resolution of approximately 100–150 nm, the team was able to measure and record the flow of current in small synaptic terminals for the first time. “We replaced the conventional low-resolution optical system with a high-resolution microscope based on a nanopipette,” said Dr Pavel Novak, a bioengineering specialist from Queen Mary’s School of Engineering and Materials Science. “The nanopipette hovers above the surface of the sample and scans the structure to reveal its three-dimensional topography. The same nanopipette then attaches to the surface at selected locations on the structure to record electrical activity. The research opens a new window into the neuronal activity at nanometer scale, and may contribute to the wider effort of understanding the function of the brain represented by the Brain Activity Map Project (BRAIN initiative), which aims to map the function of each individual neuron in the human brain, according to Novak. The research also involves scientists from University College London and Imperial College London.